2. List of individual photo collections. 3. In Memoriam Photos pages. The Dual Nature of War Photography! History is little else than a picture of human crimes and misfortunes. In modern times, still and motion photography has become perhaps the single most important element that stimulates our interest. Introduced in the U.S. in 1839 with the advent of daguerreotype, over a million photographs define our understanding of the Civil War, and photographs have defined our understanding of every war since then. In fact, the captions on two of the most powerful images of the Vietnam War (the girl running from the bombed village and the helicopters on the roof during South Vietnam's final days) were deliberate lies to score political points, yet so powerful were the photographs that those myths prevail today some 30 years later. War photographs can serve a variety of purposes besides propaganda. Like nouns, they can show people, places or things. Like adjectives, they can depict living or working conditions, battlefields or the aftermath of battle. Like verbs, they can trigger actions like recovery of faded or suppressed memories, and like adverbs they can modify or condition those actions and highlight or emphasize the historical record. From nearly 200 years of war photography, we gain a perspective that there are really two main types of war photograph - those that show combat, and those that don't. Many of the most famous war photographs such as the flag raising on Mt. Suribachi depict the effects of war, rather than combat itself. The reason is pretty simple, for most of us, a camera is not our highest priority when under fire. 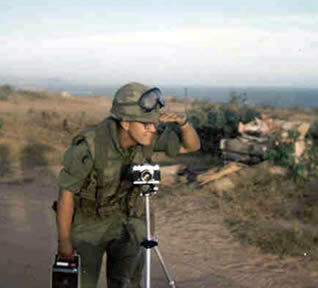 Many professional photographers have died getting too close to the action; some 135 died in the Vietnam Wars alone. Most of the photographs on this website were taken by soldiers assigned to the 1st Battalion (Mechanized), 50th Infantry. In a few cases, professional photographers took them. Speaking for myself, I never expected that my "happy snaps" would ever be works of art or would ever form part of a valuable historical record... and I was probably correct: however, many of the photographs by my fellow soldiers on this website really do show history... the history that we were part of... the history that we helped make! Despite that, few of our photographs show actual combat. itself . We were, after all, combat infantrymen... with a tough job to do. And so our photographs carry on, in a modest way, the traditions started by Mathew Brady, Timothy O'Sullivan and Alexander Gardner and honored by such distinguished photojournalists as Frank Hurley, Damien Parer, Georgi Zelma, Joe Rosenthal, Therese Bonney, William Eugene Smith, Larry Burrows, Robert Capa, Henri Huet, and Kyochi Sawada. NOTES: Collections are compiled as received and posted as hypertext links as they are published. Individual photos are taken from these collections to use elsewhere on this website. Below are pages posted in memory of our fallen brothers. In 2006, at the suggestion of then Association President Randy Smith, efforts began to assemble a list of family and friends of all our men KIA during the 50th Infantry's deployment in Vietnam. Association Historian Jim Sheppard expanded this idea and created memorial pages for each man...complete with action description, KIA location maps, burial information and photos for each man. The effort took over 12 years, but photos were finally all found by April of 2019. All these memorial pages are "linked" below, including 33 men who were found not to be part of the 50th Infantry... but listed as such prior to accurate KIA records being assembled by the Coffelt Vietnam Casualty Database Team of volunteers. © 2003-2011, ichiban1.org and the individual contributors represented. All Rights Reserved. Ichiban1.org is the website of the Association of the 1st Battalion 50th Infantry. No photograph may be downloader, copied or used in any way without the expressed written permission of the copyright holders. Please refer to our Copyright Policy. Publish your 1/50(M) photographs on the Association website! Remember that posting up photos may take time. If interested in having your photos here on this page, please contact the Website Committee.